Sports are an integral part of the school’s approach to overall student development. 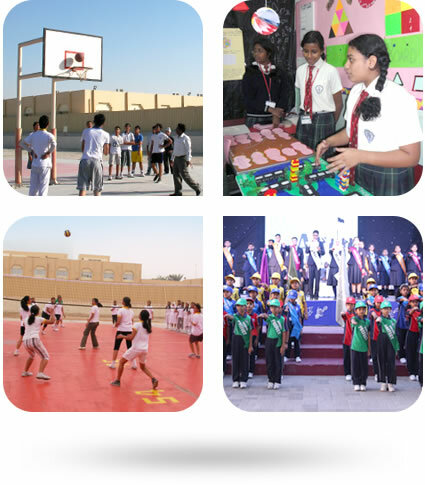 Gulf Indian High School has excellent infrastructure for Football, Basketball, Volleyball, Cricket and Badminton. The students participate in track and field events, as well as intellectually stimulating games like Chess, Carroms. Special coaching is offered to students after school hours by a team of committed Physical Education teachers. The students have won several prizes at various Emirate, Inter-Emirate and national level tournaments. Developing interests is a key goal of GIHS education. Students are encouraged, guided and supported as they identify, enjoy and explore to pursue a passion and develop new interests. For this purpose, we have various clubs that cater to a myriad of interests and specialties are meticulously designed to benefit our students for a rich academic and social life. We emphasize full engagement in the school life beyond classroom experience. Everyone finds the joy in joining a club and feels that it’s a winning way while they travel through a unique journey of self-discovery. Student leadership is The Backbone of the GIHS experience. GIHS is committed to bringing out the creative abilities of students and actively engages them in various arts and cultural activities. All the activities are scheduled and held during the School hours on Thursdays and on Saturdays. Variety of competitions are held at regular intervals in different clubs. Awards are given for the best performing clubs. Learning is not just informing about emerging developments and issues but it is necessary for participation, partaking and sharing. Every year the students go on educational tours to various parts of the UAE and to other countries to gather more knowledge about world culture in order that they become global citizens.